Las Vegas-based author, Gerald J. Kubicki, has been winning over readers with his Dubious Mystery Series, featuring Colton Banyon, an average guy who finds himself at the center of extraordinary situations, along with his spirited girlfriend, Loni, and a unique cast of characters. 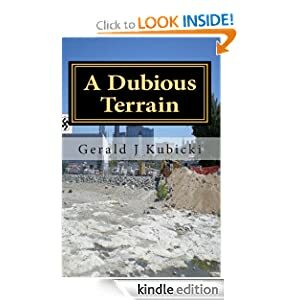 In his most recent installment, A Dubious Terrain, the fourth novel in the series, Kubicki addresses race relations, illegal immigration, the absolute power of Homeland Security, and municipal corruption, in his page-turning plot. A white-supremacist organization, the Effort, has been infiltrating American society for decades. Originally sent by its Nazi German superiors to study at Harvard University in the thirties, its members have developed contacts with America’s wealthiest and most influential people. The Effort’s scheme is effective, garnering members in key positions at every level of industry, the media, entertainment, and the super government agency of Homeland Security. Now they have hatched a plot to take over the American presidency. The insidious plot that Banyon uncovers involves illegal immigrants, politicians, Homeland Security, drug dealers, and even the mayor of Las Vegas. Banyon and company must stop the plot before it’s too late. A Dubious Terrain is more than just your average mystery adventure. There is the timely treatment of current important topics through fiction, continuing in Kubicki’s tradition of spearheading our nation’s social issues, intermixed with humor and heart-racing adventure. Kubicki considers himself “an average guy who can write,” starting his career as an author after a long career as an executive, which took him around the world, with experiences that lend themselves well to his settings, themes, and way of looking at the world. Readers will undoubtedly be left anxious for the next installment in the series, A Dubious Plan, which is slated for release in July, 2012.